VandaCare, a preventive healthcare IT solution, make early intervention to prevent or reduce non-communicable diseases (NCD) morbidity possible. It is more than just a health tool, but also an empowerment tool to help us to take on more responsibilities for our own health. With the availability of VandaCare, we can translate what is put into words in New Year resolution into practice. It allows us to execute what has been planned, without any further delay. 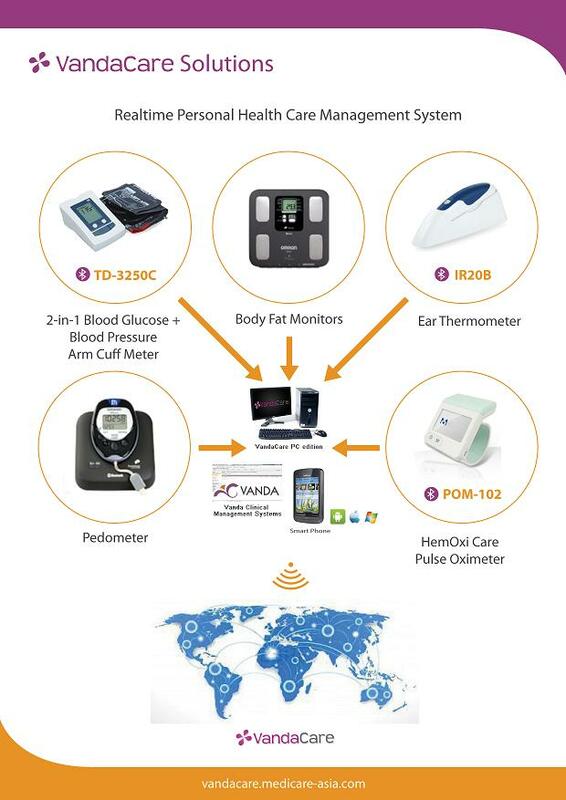 VandaCare provides us an effective way to record, access and manage personal health data at anytime, anywhere via smart phones and computers wirelessly over the cloud. It tracks health data including blood pressure, glucose, temperature, BMI, oxygen level, Cardio info, heartbeat, Calorie etc. It also indirectly triggers us in making the right lifestyle choices to prevent from lifestyle-related morbidity. Ultimately, VandaCare assists us to achieve the goal of living lives to fullest in a healthy manner. For patients, it allows caregivers to remotely monitor the patients’ results via the internet. Patients, family, primary-care center, a general practitioner, a specialist and consultants in government or private hospital can easily gather and analyze digital data remotely and therefore efficiently respond to a patient’s situation e.g. medication effectiveness and adjustments. VandaCare System is designed specifically for preventive healthcare purpose. It is not intended for emergencies or real time patient monitoring.